INDIANAPOLIS — Recycle Force is not just a place where they are re-purposing all the electronics we throw away, but it's also a place where they are re-purposing the lives of people who come out of prison. 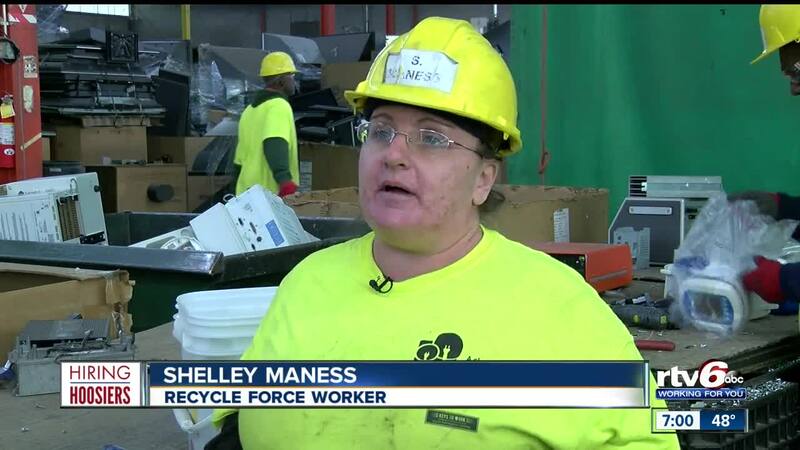 Shelley Maness is working at Recycle Force, gaining experience and training, while she's finishing a work release program. Maness spent four years at the Madison county correctional facility due to her drug addiction. The Recycle Force program is helping her improve her life. So when she's ready to return home, she's also ready and qualified to get a job. "I love me now. I didn't love me before," Maness said. "Being here, has given me the best opportunity I could have. By having the skills and getting the skills, I get paid to do it." Glenn Johnson, Executive Director of Business Development, said what Recycle Force is doing is "huge." "What's happening is that when individuals are leaving Recycle Force with that extra training, they are better prepared for traditional employment," Johnson said. "It's also allowing them to feel more prideful about their next step and their career." Recycle Force is just the first step for these workers. They operate on an "A-B-C" motto: "any job," "a better job" and eventually "a career." Through a partnership with the City of Indianapolis, many of the workers go on to be a part of a program called "Keys to Work." Where they get temporary jobs with places like the department of Public Works. Last year, the workers helped remove 136 tons of materials associated with illegal dumping. It's programs like these that are helping make the community safer. And our neighborhoods better places to live.